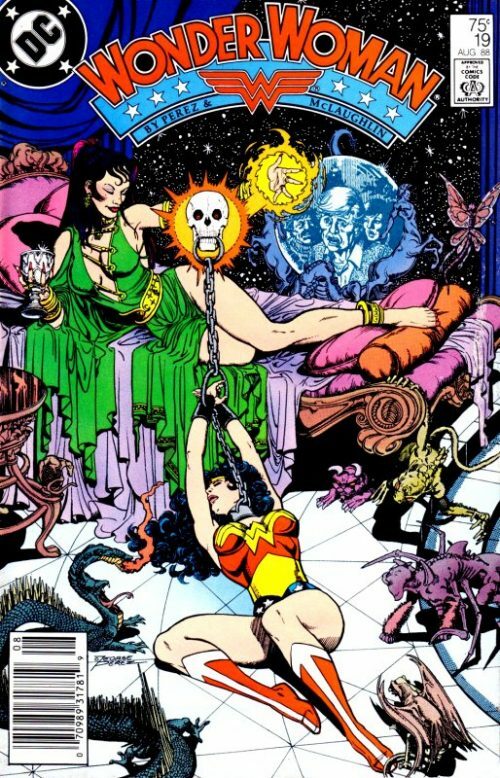 This issue sees Circe’s subtle tormenting of Wonder Woman increase and as a result, Diana finally realises that her recent personal problems are all of the Witch’s doing. 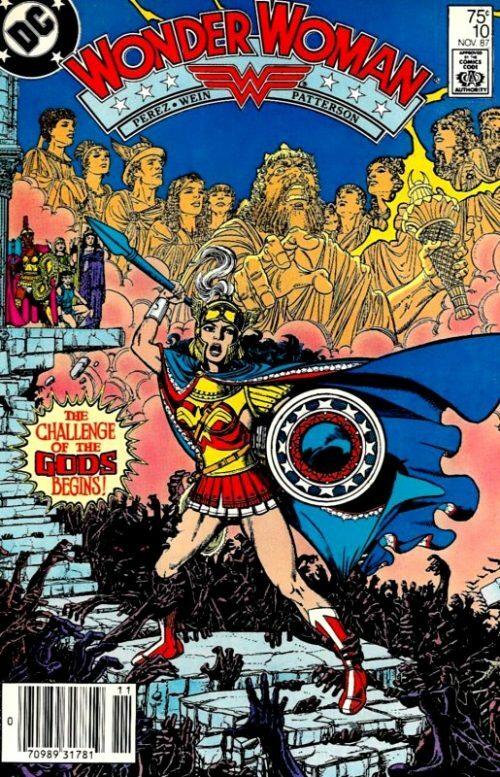 We also see a parallel story begin as a serious of brutal murders seem to point towards the Amazons as their perpetrators – including Wonder Woman herself! 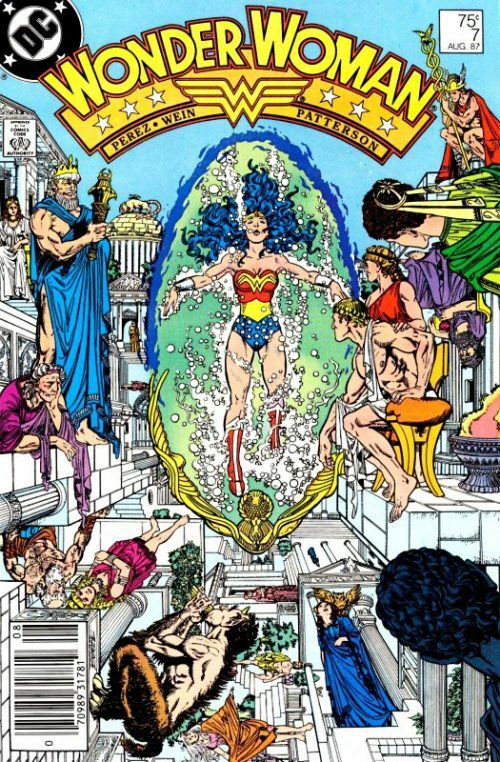 The artefacts that are stolen at the scene of each murder are also part of Circe’s plans, which will culminate in the major crossover event “War of the Gods”. At the Metropolis Museum of Archaeology police have cordoned off a crime scene. Lt. Dellrosa Marshall arrives and shows her badge to the officer on guard outside the building. She steps inside and is lead to where a bloody sheet covers a dead body on the floor of one of the exhibit halls. Dellrosa is told how the Museum Watchman had been hacked to pieces by an unknown attacker. His head had been cut clean off and his mouth had been stuffed with pieces of torn paper, with strange scrawls written on them in his blood. Elsewhere it is night time on Themyscira. The Amazons sleep in peace as they have done for countless centuries but one among their number tosses and turns, her slumber one of constant tormenting dreams. Diana admonishes herself for letting these dreams bother her as they are nothing that should torment the greatest of all Amazons. And yet…they seem so real. Suddenly her eyes snap open and she finds herself dressed in her costume, floating above the city of Areopagus. She tells herself it is only another dream because how could she have possibly breached these walls without disturbing Lord Ares? As she flies through the deserted passageways she marvels at how this is the most realistic dream yet. She can even smell the stench of rotting flesh dipped in sulphur. But nevertheless it must all be a trick of the mind. 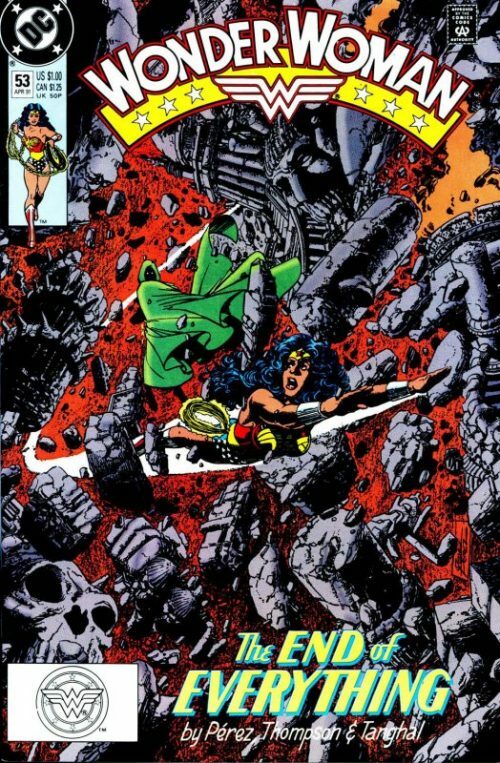 Just then she finds herself confronted by Ares’ daughter, Harmonia, who asks Wonder Woman whether this is her nightmare or Harmonia’s? Indeed, this would not be the first time that the goddess has dreamed about the Amazon Princess. 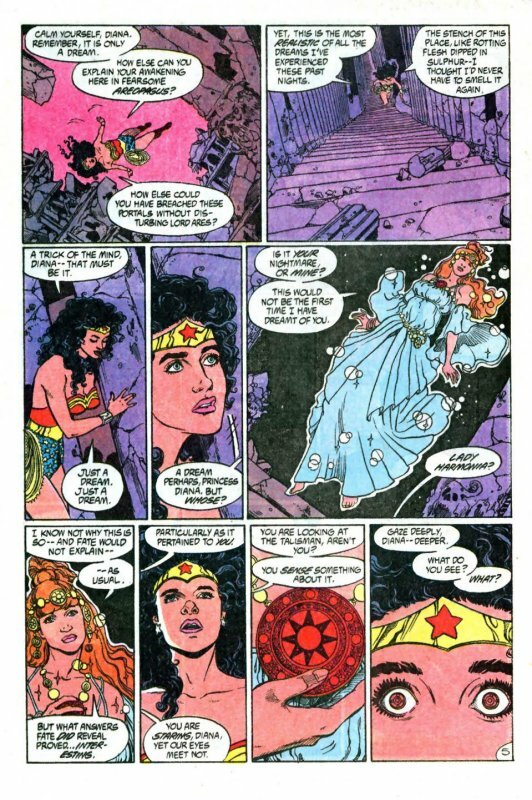 She then tells the puzzled Wonder Woman how the Fates had not explained the meaning of her previous dream but what answers they did provide were interesting…especially as they pertained to the Amazon Princess. Wonder Woman becomes transfixed by the Talisman that Harmonia wears around her neck and seeing this, the Goddess says that Diana must be able to sense something about it. She then encourages Wonder Woman to stare deeply into it and asks what she sees? Wonder Woman holds her head in her hands though and replies that she knows there is something she should see but cannot. Her eyes burn from the effort and she pleads with Harmonia to tell her what it is. The Goddess replies that she would…if she was certain this was not all a dream. If it is Diana who is the one that is dreaming, then all Harmonia says would simply be the Amazon’s own imaginings, trying to piece the puzzle together. She would only give answers that Diana wanted to hear and could not provide her with the truth. And if Diana is part of Harmonia’s dream, then the answers would not be anything more than Harmonia already knows…or dreams about. Wonder Woman suggests that perhaps this is not a dream for either of them and that maybe it is real and they are really here right now. Harmonia asks what “now” does Diana refer to? What if this is Wonder Woman’s afterlife? The Amazon Princess resolutely replies that if that were the case, then there would be no mystery because with death all is revealed. The Gods promised them as much. If such were not true then the Amazons’ faith would not exist and neither would the Gods. Harmonia smiles and congratulates Wonder Woman for lifting her spirits from the shadows, even if it is only in a dream. Diana then says that these dreams are like those she and Donna Troy had shared and which they believed were the work of Circe. But even that witch does not have the power to invade the dreamscape of a God like Harmonia! 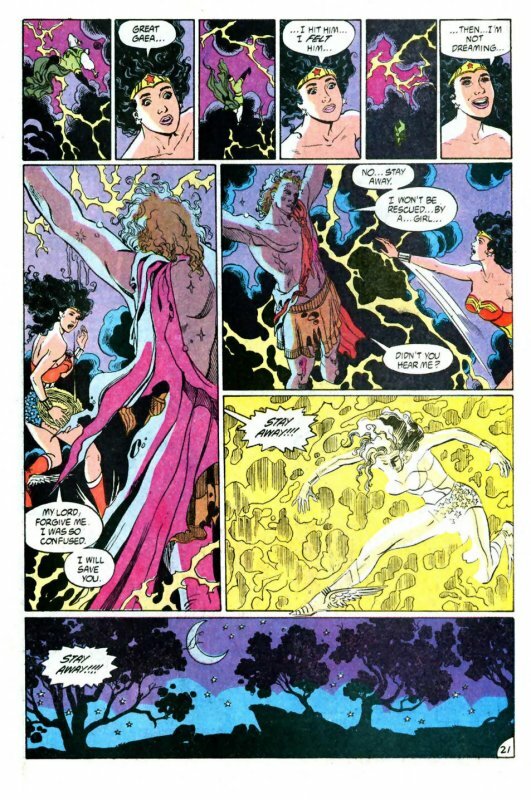 Wonder Woman turns to find that Harmonia has suddenly disappeared and as she calls out, searching for her, she hears a voice behind her say “Harmonia has gone to play her part in that which you have deemed inevitable.” Wonder Woman turns to see a figure standing there in a hooded cloak. She demands to know who he is and in response he makes the ground tremble. Trying to keep her balance, she asks him if he is mad, daring to cause such destruction in Lord Ares’ domain. As the cloak lifts away revealing a sobbing man, he replies that he cannot stop it as he did not instigate it – but by his very presence it cannot help but happen! Such is his curse…such is the cruel fate of a cosmic discard. Doomed by pride to endure the unendurable, over and over, without respite. He continues to moan as Wonder Woman attempts to dodge the falling masonry around them. “A wretched outcast on the periphery of disaster. The harbinger of inescapable oblivion. A Pariah!”. Wonder Woman refuses to believe this is all real as Areopagus crumbles around her. She cries out that she knows this is all Circe’s doing but that it will not work! She demands the witch comes out into the open to face her and warns off Pariah, ordering him to vanish back to her subconscious. “I need neither muscle nor Hestia’s magic lasso to vanquish you! All I have to do is wake up!”. She shuts her eyes and concentrates hard, willing herself to awaken. At last her eyes snap open and she sits up, crying out. She finds herself in her chambers again as Cydippe and Myrrha rush in, swords drawn, fearing the Princess is being attacked. 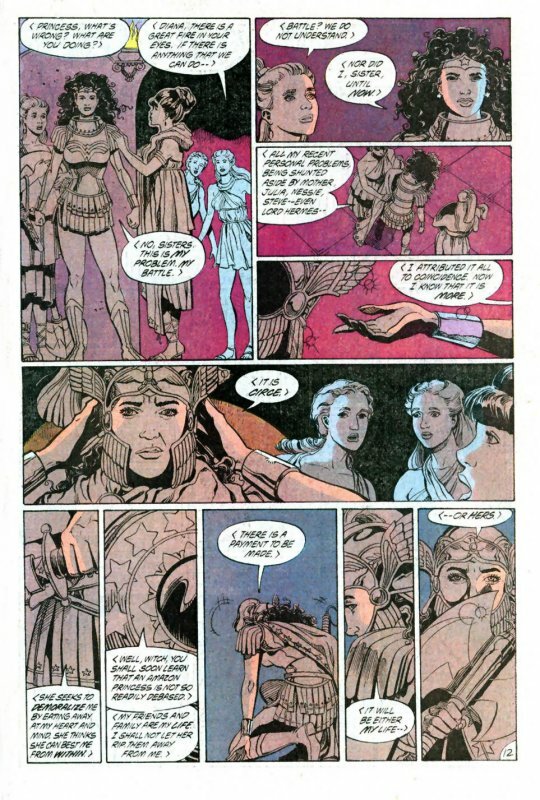 Diana assures them that she is fine and reminds them that the Amazons have sworn an oath never to bear arms again. She would not want to see that oath dishonoured because of a mere nightmare. At the Natural History Museum of Chicago Lt. Karen investigates a double murder of two security guards. He listens as the curator explains how she had heard a commotion earlier that night and had gone down to the Thanagarian Exhibit to check it out. She had called out to the two guards on duty but received no reply. She had then come across their heads lying on the floor, at which point she had called the police! As per the crime in Metropolis, nothing valuable has been stolen and the only thing missing is a cheap bronze bowl from the Indian Exhibit, supposedly used to invoke a God called Sira…. Diana has now donned her full battle armour including helmet and axe and rushes outside intent on going after Circe. Myrrha races after her, worrying that the Princess is behaving irrationally. She tells Wonder Woman that she is talking as if she is obsessed – charging off without thinking when she does not even know where the Witch is hiding. Wonder Woman replies that although she does not, Lord Hermes does. Circe has managed to evade him so far because of his current weakened state, but even Circe cannot keep it up indefinitely. Suddenly her eyes snap open and once again she finds herself in bed, having woken from yet another nightmare. Myrrha and Cydippe ask her if she is alright and seeing Myrrha is alive and well, Diana leaps out of bed and hugs her puzzled sister tightly. Diana hopes that this time she is not dreaming and looks down, relieved to see that she is naked and no longer wears her costume. She tells Myrrha and Cydippe that everything she has experienced tonight had all been a dream. Not Circe. Not a spell. Just a nightmare. The two Amazons are still concerned however and suggest Diana visits the Isle of Healing. She declines and immediately dons her costume, saying that she must leave for she still has much to do in Patriarch’s World. Her tone sounds more reassuring but her words puzzle Cydippe, who asks if there is anything they can do for the Princess. Diana smiles and replies that this is her problem and hers alone. As she lifts up into the night sky she bids them farewell and heads swiftly towards the chaos portal linking Themyscira with the outside world. She ponders that for several nights her nightmares had become unwelcome bedfellows – invaders of her slumber which she had grown to hate. But they were merely fears and insecurities manifested as angry images in her mind. All roar and no teeth. Right? She again admonishes herself for allowing such discomforting reveries to bother her. After all, they were only dreams, nothing that should torment anyone. If only they did not seem so real though. Back in Boston, Inspector Indelicato reviews his files regarding a recent murder that took place at the Peabody Museum. A guard had been savagely decapitated and an ancient coin had been stolen from the Babylonian Exhibition. Turning to the best antiquities expert he knows, Indelicato had been told by Julia Kapatelis that the stolen artifact had no commercial value. At first, the inspector had not been too concerned by the strange murder, assuming it was simply some crazed lunatic, but when Lt. Mike Shands had told him about reports of almost identical murders in several other cities he had decided to pursue the matter further. He now sits at his desk alongside Shands, with Lt. Karen and Lt. Dellrosa Marshall sitting opposite. Indelicato explains to his colleagues that the stolen coin was a ceremonial token, dedicated to a violent goddess called Apsu. It appears all the various stolen artifacts are related in some way or another to a destructive God of some sort. Shands nods and says it is indeed quite a coincidence, before opening a nearby filing cabinet and removing a file. He then asks Lt. Karen about the coroner’s theory regarding the weapon that was used to kill the two guards in Chicago. Karen replies that the coroner had suggested it was one of those big axes, like you see in a “Conan movie”. Shands then holds up a photo of Wonder Woman’s battle axe and asks “Like this?”. Karen nods but before he can say anything else Indelicato snatches the photo out of Shands’ hands, snarling that it was just the coroner’s theory and given a hundred coroners you will get a hundred theories! The other officers asks if the Boston police are holding back information but Indelicato replies that they have nothing but wild theories. He then asks to speak with Shands alone outside his office. Lt. Karen and Lt. Dellrosa Marshall can hear the two men arguing as the inspector snaps that they still have no proof what so ever. Shands responds that if these robberies and murders have nothing to do with the Amazons, then how come each one of the crimes occurred in a city where one the Amazon delegation was touring. Hellene in Chicago…Phillipus in Metropolis…etc. Indelicato reminds him that not a single Amazon had been in Boston on the night of the murder at the Peabody Museum. Shands questions whether he has checked with Professor Kapatelis as to Diana’s whereabouts that night. The inspector replies that he has and Diana was definitely not in Boston on the night of the crime. Meanwhile in the chaos portal between Themyscira and Man’s World, Wonder Woman confronts Pariah again, asking him what he has done to Hermes. Pariah simply repeats what he had said in Areopagus and she clamps her hands over her ears in frustration, crying out that she must still be dreaming and is eternally trapped in this nightmare. Hermes groggily turns his head on hearing her words, murmuring questioningly “Your dream?”. As Pariah continues to recount his morbid woes, Wonder Woman finally snaps and punches him, sending him flying across the sky! As she watches him disappear into the distance she suddenly realises that she had actually felt him when she had connected her fist. Which means she is really awake and no longer dreaming!